mestinya tuh ivangunawanovich dah di kemaren sama Mike Riley! 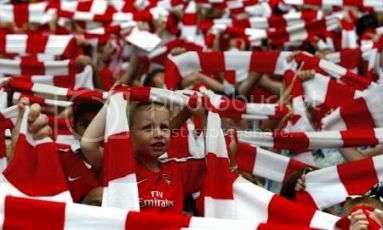 o 2 o 2 b o 2 b a.. GOONERS !!! selamat buat part III nya RvP..
RvP kaga cedera, cuma disimpen doang kok..
wah..minggu ini lawan siapa aja sih selain pool ? mggu depan lg penutup bulan ini. lawan boro..
nyebelin bgt dia selebrasi golnya kemaren..
OOT deh, Rvp jadinya cedera ga??? Klo iya berapa lamA? Robin van Persie has warned that Arsenal have no time to dwell on their FA Cup Semi-Final defeat. The Dutchman was on the losing side on Saturday as Chelsea struck late to end Arsenal's hopes of a Wembley return in May. Van Persie's woes were compounded by a groin injury which forced him off with 15 minutes remaining and could sideline him for tomorrow's trip to Liverpool. Arsenal.com will have the latest injury news on Monday afternoon but, whether or not Van Persie plays at Anfield, he knows that Arsenal must pick themselves up quickly with seven games packed into the next 25 days. "We have to look game by game, because if you look at the schedule from now until the end of the season, it makes you a bit dizzy because we have big games every three or four days," he said. "We still have two targets now - that is the Champions League Final and to finish fourth, or even third in the league. "We are disappointed, but we need to get our stuff together and fight for the other two titles. We have to play the game againsht Liverpool on Tuesday now, whether you are happy or if you are not happy. "It is the Premier League and we need those points, but I am confident because we have strong characters. Every experience makes you stronger, a good one and definitely a bad one." Van Persie also defended Lukasz Fabianski after the Arsenal goalkeeper was criticised for his part in Chelsea's winning goal at Wembley. "Lukasz is a fantastic keeper," said the Dutchman. "He is really brave and is strong mentally. He knows exactly what he wants, so I am not worried about him at all."